Today, businesses are faced with an increasing number of requests to provide their bills to each customer’s preferred eInvoicing portal. Electronic Invoice Presentation and Payment (EIPP) previously focused on the building and managing of self-service processes; using a manual or automated ‘upload your bill’ strategy. This month in eBilling Insight, we look at the ideal EIPP solution for large business customers. In Europe alone there are over 400 companies offering eInvoicing solutions. This means that companies sending invoices to business customers have to integrate with potentially hundreds of different systems and portals. What billers require is an eInvoicing solution that provides flexible output formats, while meeting the various eInvoicing standards. Whilst the invoice receipt side is constantly being improved, the invoice generation side has been neglected. Businesses are fast discovering that navigating the eInvoicing data streams can be a full time job. Is there a verstile EIPP solution with flexible output format? Striata’s EIPP connectors deliver your eInvoices to the major eInvoicing hubs around the world, whilst delivering a secure eBill to the rest of your customers. Our flexible output formats are able to provide each portal’s required format (EDI, XML, SOAP) without having to “belong” to or install portal software. 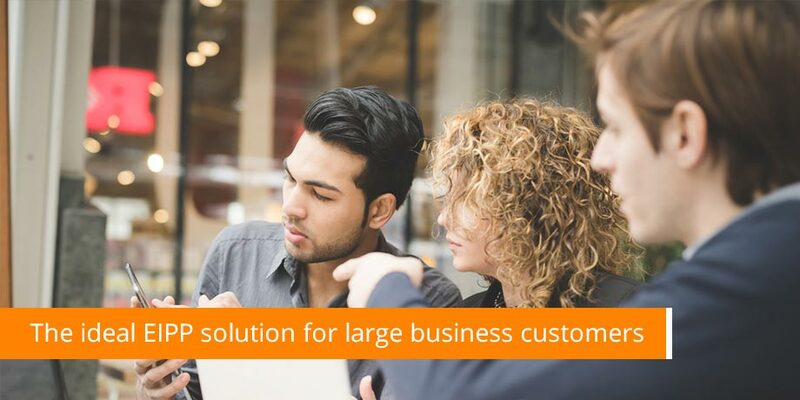 This solution is ideal for large business customers who generate more than 5 or 6 eInvoices per month. eInvoices are delivered in both machine and human readable formats. Detailed ‘invoice presentment and payment’ can be delivered, without requiring a website visit. Flexible output formats means invoice data capture is eliminated at the eInvoicing hub. Payment can be made directly from the invoice – a securely encrypted email attachment. Multiple file types can be securely personalized, packaged, encrypted and compressed into a single email. Incentive trade discounts, through early settlements are easily automated. As eInvoicing gathers momentum, businesses will be required to spend more time and resources billing their customers accordingly. The solution is to implement a flexible eBilling solution that can deliver the billing information in the required format, which ultimately streamlines the eBilling to eInvoicing process.